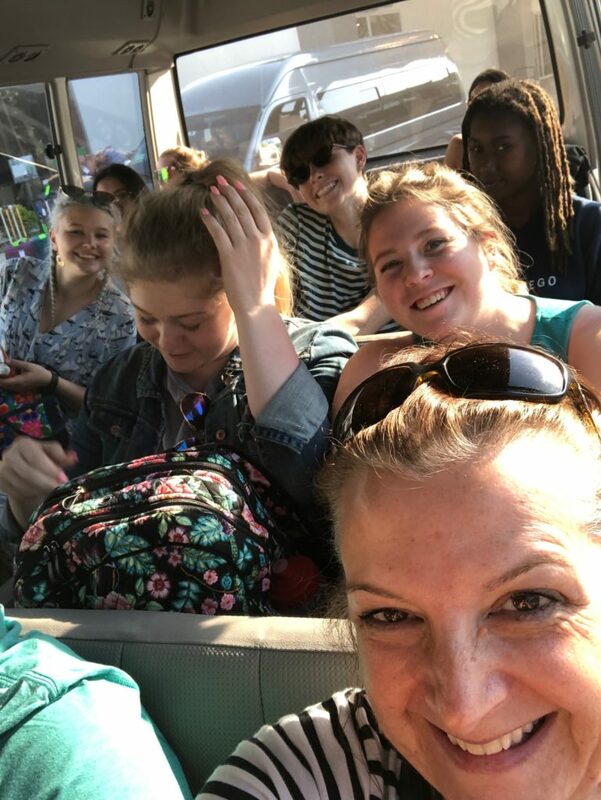 On our way – Helen Walter, Ph.D.
For the last few days we’ve been going through logistics making sure we’re all ready to set off for our trip to Roatan, Honduras. 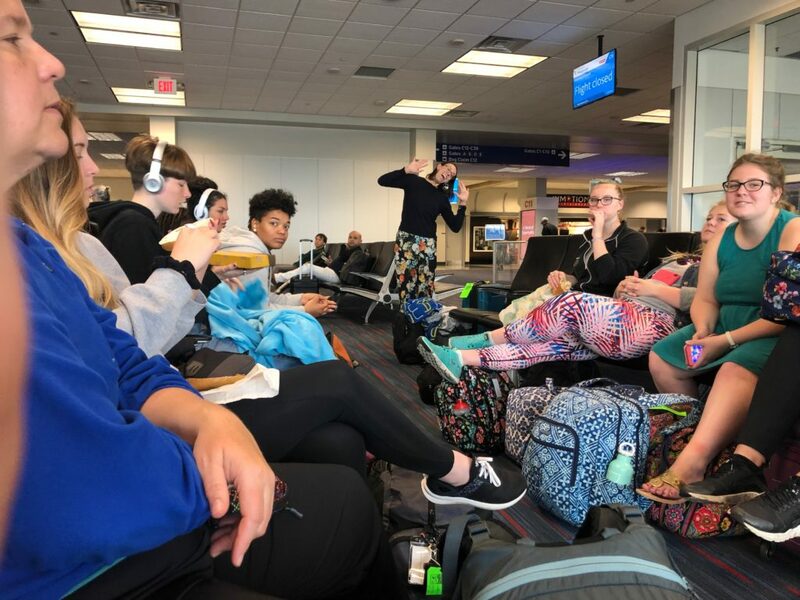 This started Monday, when Chicora Martin, our Dean of Students who’s coming on this trip with us, Hayley Chamblin and Sophie Conroy, our trip Teaching Assistants, and myself (Dr. Walter) met to go over all the little pieces to make sure we can get the 10 students to the airport. Wednesday we went over this with the class, and now I am sitting at the airport writing this as we wait for our first flight to Dallas. Our evening started with us meeting the students at the ‘T’, going through all the things students need for the trip, and making sure they had everything. We then loaded up Cbicora’s truck with their suitcases, got them in the Mills van and headed to the airport. Traffic was so-so, the normal Bay Area late Saturday night bridge traffic. 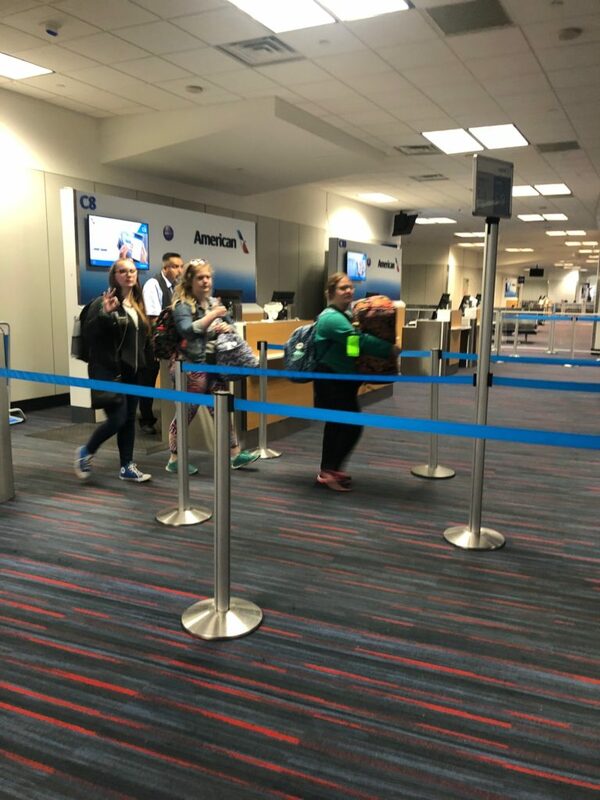 Thankfully check-in was smooth, especially considering we’re transporting 8 heavy metal sand screws for our coral restoration project. 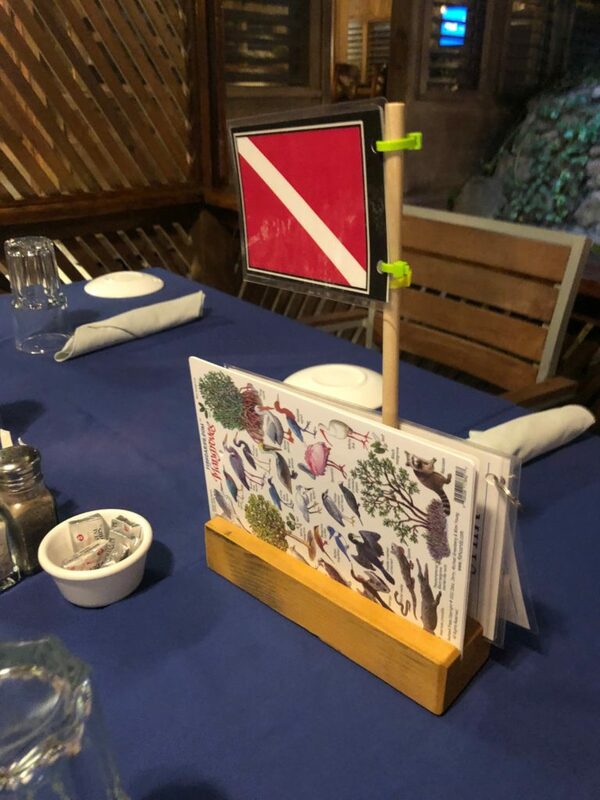 The funds for these were raised in conjunction with our friends at Rogue Embroidery and our student Dive club – the Aquanauts – who’d sold T-shirts and hats before we left. This was followed by a small delay in security as all the students made their way through, but nothing major. After a week of heavy grading (2am sessions several days in a row to finish) for my other class (Immunology) I’m, as we say, ‘Cream crackered’. We arrived in Dallas at 5:30am.. or 3:30am Pacific time.. Very early!! A little bit blurry eyed! But half way there in Dallas! Some of us had managed to get a short nap on the plane. I am happy to say that my Air Force brat training allowed me to just fall asleep after trying to watch a movie for a brief period of time. At Dallas we gathered briefly to make sure everyone knew the next step, and then we all headed off to get some breakfast. After breakfast, and making sure we grabbed lunch, we headed to the gate to wait for our plane to Roatan. The plane flight from Dallas didn’t go as well.. we got stuck on the tarmac. Apparently the pilot and co-pilot were about to get heatstroke in the cockpit due to a failure in the AC in that location. It was about 95F and climbing while taxiing out to the runway. So back we turned and sat at the gate while they tried to fix it. That wasn’t working, and to work on it they had to turn off our AC, so then they deplaned us. Because that would delay our activities when we arrived we decided to go through some of the activities we’d planned for the first night. Trying to think about what’s ahead rather than worried about our airplane! 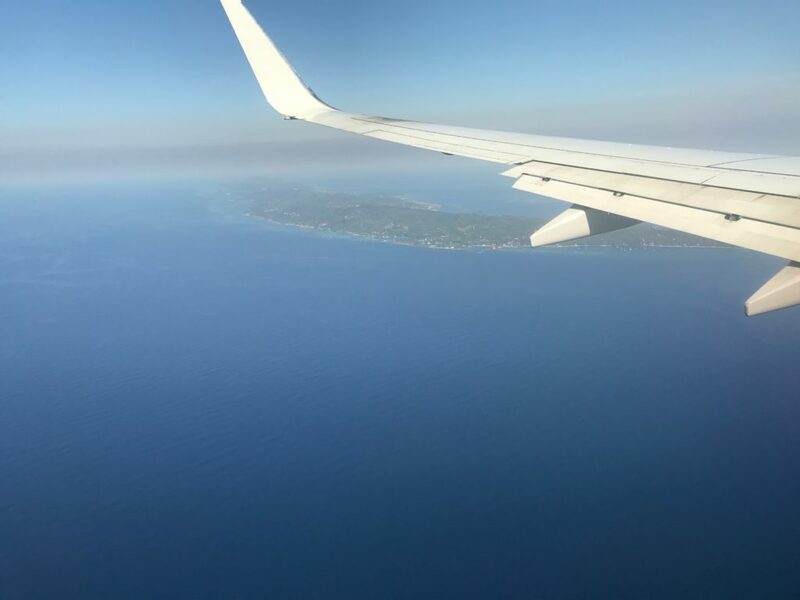 Bathroom trips, a Starbucks trip and then fast forward an hour or so later and we managed to take off and had an then uneventful flight to Roatan. Our first view of the island that’ll be our home for the next week. 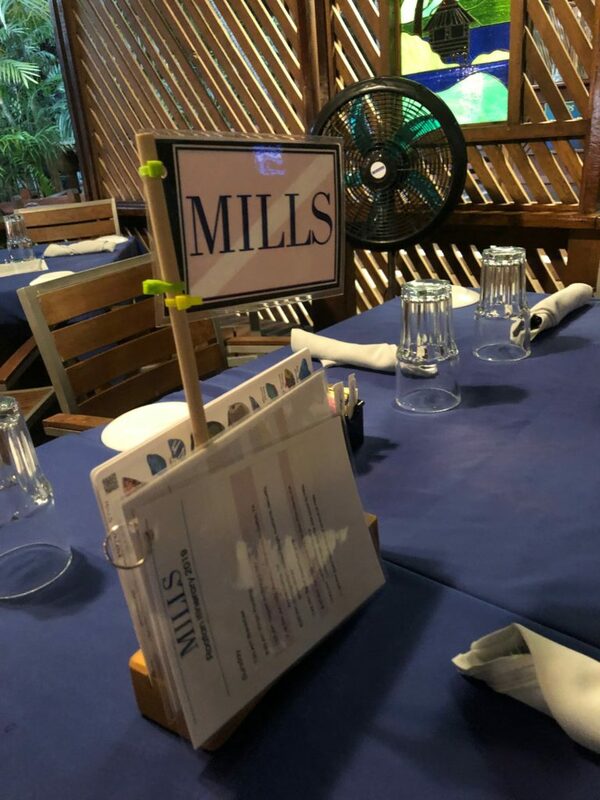 Immigration was uneventful, as was picking up our bags – including the 8 Sand screws we’d brought for our host institute – The Roatan Institute of Marine Sciences – and we passed through customs without a hitch, all bags in tow. Our host resort met us at the gate, and we quickly were boarded onto the van for our ride to the resort. We’re on a van, on Roatan! 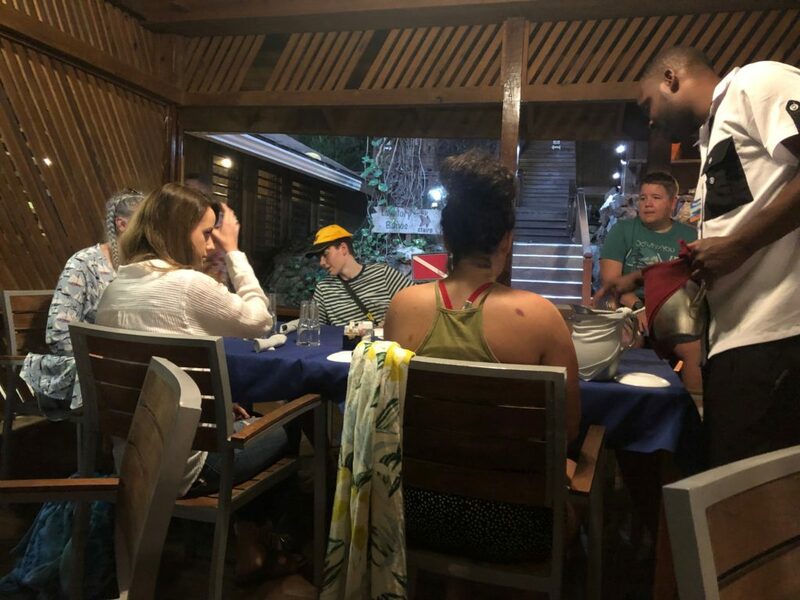 We arrived at Anthony’s Key a little later than planned, so we moved the schedule around a little.After a brief orientation the students headed to their rooms to unpack and then we met them for dinner. Most took an opportunity to try out paddleboarding before though! My dad made us these stands which we’d seen on another groups table last year. This is the other side to the stands. Each table has one with some ID cards and a daily schedule. Dinner was scrummy! I had mushroom soup, then beef tenderloins and then some caramel mousse for desert. It’s now time for bed. Tomorrow we start early as we have to make up a little lost time from today! Good night! Previous: Previous post: Almost There..
Next: Next post: Monday: Last One In Is..